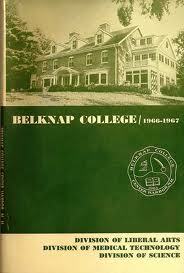 Belknap College (1962-1971) was a liberal arts 4-year college in Center Harbor. The Nichols Library contains a small collection of yearbooks, course catalogs and other archival materials. The College was founded founded in 1963 by Dr. Royal M. Frye and Virginia M. Brigham. 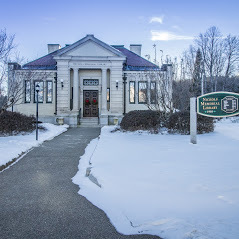 Their intention was to establish an alternative to the College of Advanced Science in Canaan, where Dr.Frye was employed, which at that time was said to be having management issues. Dr. Edward Dane was the school’s largest benefactor. The college offered a four-year program in the liberal arts. Students took courses in the social sciences, humanities, and natural sciences. A two-year associate degree was also offered. The college had no professional or advanced programs, but a program in medical technology was offered to women students. The science and mathematics faculty was the largest (13), followed by technical programs such as business admin & medical technology (8), English (4) history (3), languages (3), other social sciences (2), and the arts and humanities (2). Much of the Belknap College campus was on land and buildings that were part of the Dane Estate. The Coe House in Center Harbor was the women’s dorm at Belknap College. The Red Hill Inn was one of several buidlngs that served as men’s droms. The Garnet Inn housed the campus dining hall. The campus was spread out along nearly the entire length of route 25B. The school found it necessary to operate a bus, which ran up and down that hill on an hourly basis so students could utilize the steep and lengthy campus. Despite the good will behind its founding, the new college never found its legs financially. It lacked older alumni who could support it. The absence of endowment income put pressure on trustees to cover budget gaps. Also, because Belknap never gained accreditation, its students had difficulty obtaining federal loans, entering graduate programs, or competing for jobs. The financial strains eventually forced the college to close its doors at the end of the Fall 1973 term. Although its history was short, the college is fondly remembered by its alumni. In 2013, they unveiled a memorial bench and plague across the street from the site of Garnett Hall. To commemorate the anniversary, the Center Historical Society will exhibit a display of college memorabilia. 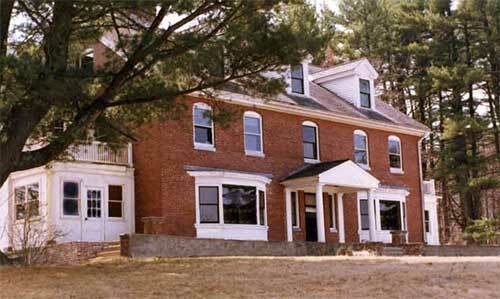 For more information about Belknap College, visit the alumni website or follow the discussion on the Winnipesaukee forum, which links to articles in the Weirs Times on the founding and demise of the college. I still often think of the great times and people I met at Belknap….peace to all. Lee.